Native westslope cutthroat trout swim in the north fork of the Flathead River in northwestern Montana. The species, which thrives in cold temperatures, was one several topics of conversation at a recent fish climate change workshop. Photo courtesy of Jonny Armstrong. They came from as far southeast as the Florida Keys and as far northwest as Fairbanks, Alaska, as a congregation normally separated by physical distance, but united by one growing concern: to find ways to help lessen the effects of climate change upon North American fish and fisheries. From June 1-5, a diverse collection of 27 fish experts (plus two remote attendees) representing a wide gamut of sectors, including the U.S. Geological Survey (USGS), universities, conversation agencies and state natural resource departments from both the U.S. and Canada converged in Bozeman, Mont., at the Northern Rocky Mountain Science Center for a workshop under the working title of “The Effects of Climate Change on Fish and Fisheries” that was organized in large part to the efforts of two members of the CAFNR community: Craig Paukert and James Whitney. James Whitney (left) and Craig Paukert. Photo by Stephen Schmidt. “From an administrative side of things, I think it really shows the link between the academics right here at the University of Missouri as well as other universities to applied research to help states, federal agencies and the nation to deal with this complex issue,” said Paukert, who serves as a cooperative associate professor as part of the USGS Missouri Cooperative Fish and Wildlife Research Unit Faculty. The results of their discussions and related research conducted in preparation of the workshop, which focused on freshwater and diadromous (those that migrate between freshwater and saltwater), will be published as four papers in a special climate change issue of the peer-reviewed journal Fisheries next spring. Among the discussion topics at the workshop was the uncertain future of fish that only live in cooler waters, including trout and smallmouth bass, when compared to fish that prefer warmer waters such as catfish, bluegill and largemouth bass. Furthermore, in studies conducted by Paukert and other CAFNR researchers, it was discovered that for every one degree increase in stream temperature, a smallmouth bass had to eat 27 percent more food to grow just 6 percent. Additionally, smallmouth bass that use the coolwater areas near springs may have faster growth. “Each species has its own optimal temperature where it functions best at, so climate change is going to shift those optimal temperatures and affect each species differently,” said Whitney, who also serves as a postdoctoral researcher. In addition to the known water factors such as increasing temperatures and decreasing amounts of dissolved oxygen content, many other determinants remain unknown, including invasive species and land-use change. A school of native bull trout swims in the cool waters of the Flathead River near Glacier National … Expand ▸A school of native bull trout swims in the cool waters of the Flathead River near Glacier National Park, Montana. Photo courtesy of Jonny Armstrong. 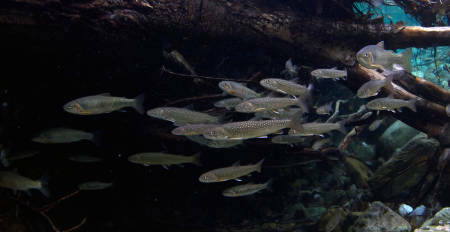 Here in Missouri, Paukert said the numerous springs found within the Ozarks add to the complexity of predicting the survival or possible adaptation of certain fish. “We have projections for air temperature and water temperature relationships, but when you include these springs it’s harder to predict what those temperatures are going to be like,” he said. 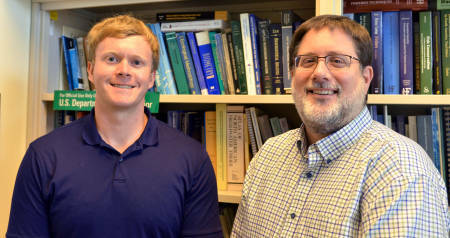 Recent work by Paukert and Jacob Westhoff, a postdoctoral fellow in the fisheries and wildlife department, have found ways to estimate stream temperature when springs are involved, but much more work is needed to estimate stream temperature for entire regions or states. Still in spite of all of these challenges, Paukert remains optimistic about what can be done after listening to stories of how several state conservation and natural resources departments have begun to pool their resources and set up collaborative initiatives. Last summer — when the Earth’s temperature would go on to be the warmest on record since 1880 — Paukert was asked by the National Climate Change and Wildlife Science Center to conduct a holistic workshop on all matters relating to climate change and fish, following an initial request from the American Fisheries Society. He had previously served on a committee related to biodiversity and ecosystems as part of the federal National Climate Assessment in 2011. Paukert hired Whitney to help run the workshop in November 2014. The two then worked with Abigail Lynch at the USGS to compose the list of invitees and to create four subcategories, which are the subjects of each of the published papers: the overall effects of climate change on the physiology and organismal biology of fish, climate change’s effects on fish populations and communities, how to help management agencies make fish more resilient to climate change and the human aspects of climate change, such as recreational fishing. Over the next several months, Paukert, Whitney, who will be begin teaching at Pittsburg State University in January as an assistant professor in biology, and other members of the USGS will be sharing their findings with presentations at the American Fisheries Society’s annual meeting in August in Portland, Ore., and the North American Wildlife and Natural Resources Conference in March in Pittsburgh, leading up to a possible Capitol Hill briefing on the matter later in the spring.